In the age of Bezos, Gates, Musk .. should we be be producing PhDs? Last night at dinner I met a very bright young couple. One lady with a science background is, of all things, working on interior design for Lockheed. Her wife, also bright, is an entrepreneur working on a social media start up … sort of a YELP rival but focused on small businesses. Go figure how STEM fit these folk’s needs. Are we doing the right thing by pushing STEM? Are vocational degree a good thing for American education? A telling example may come from, of all places, Ethiopia. The ancient nation, finally free of decades of civil war and a failed effort at sovietism, is trying to become a modern, middle class state. So, there has been a huge investment in production … of PhDs. That effort to mint doctorate level educated Ethiopeans is successful but so far output of Ethiopian Ph.D.s is not all that useful in stimulating the economy. This is not because Ethiopia’s own schools are not so good. 75% of Ethiopean PhD holders completed their studies abroad using funding from foreign sources. The majority (26.2%) studied natural sciences, followed by agricultural sciences (21.4%), social science (18%), engineering and technology (18%), medical and health sciences (6.9%), and humanities (8.7%). The STEMness of the effort is all too familiar. So, when an Ethiopian looks for a job at home, where does he go? Nearly 80 percent of the PhD holders work in higher education while the rest are distributed in government offices (11.3%), private non- profit organization (5.6%), and business enterprises (2.1%). The unemployment rate among the PhD holders is 3%—not a negligible number. 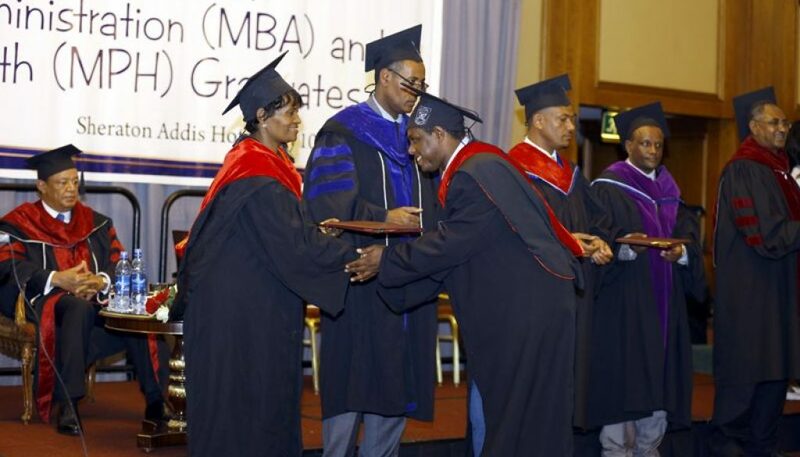 These Ethiopian graduates do not appear to be successful in obtaining patents. Of the small number 95% of the patents obtained did not result in commercial products, processes, or a license. Only 2.6% managed to start one company and a meager 0.4% started two companies. So. all that STEMNESS seems to be the favor de jour for government jobs? A variety of reasons have been suggested to explain the performance in research and innovation.The PhD holders cited working conditions (26.2%), low remuneration (21%), limited job opportunities in research, absence of a research career structure (19%), and a lack of interest (2.9%)as key factors. Only a limited number of the PhD holders indicated satisfaction with their job and working conditions.